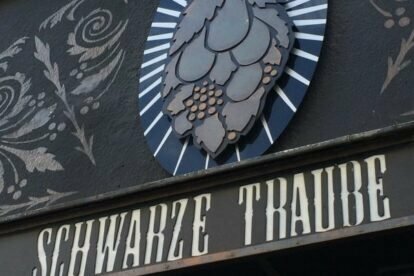 First of all, Schwarze Traube is a cocktail bar. No wine, no beer. Knock on the door and smile when you’re greeted by the doorman. It’s a small place so I would veer away from visiting with larger groups. It’s an intimate affair, from the seating all the way to the drinking. The space is dimly lit with black walls printed with golden fleur-de-lis, bird cages and decorated with stylish vintage trinkets. My favourite detail is that there is no menu to skim through. You just need to know what kind of flavours strike your fancy: vodka, gin, rum, whisky, spicy, fruity, creamy, traditional or house infused liquors. Once you tell your waitress/er your wish they will pass the message on and have the bartender whip up a dreamy concoction made especially for you. Even the glassware is unique, chosen exclusively for your special potion. One of the owners, Berlin’s own Atalay Aktas is one of Germany’s best mixologists, and surely the continent’s but we don’t want to brag. Hah! If you’re lucky enough to visit on a night when he’s mixing you’re in for a treat. There is dancing, singing and sometimes even poetry in his drinks. Here, mixing cocktails is like an art performance, and your only mission is to savour every last drop.